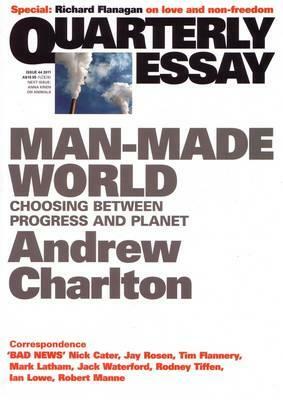 Andrew Charlton has won the John Button Prize for 2012 with his Quarterly Essay on climate change, Man-Made World: Choosing between progress and planet. A big congratulations to the winners for 2012. This annual award recognises the best writing on policy and politics in Australia. Andrew Charlton, a senior economic adviser to former Prime Minister Kevin Rudd, was named the winner of the John Button Prize last week taking home a $20,000 prize. The judges described Charlton’s essay as a ‘dispassionate, reasoned and original analysis that confronted the core dilemma behind global attempts to address climate change – the huge gap in priorities between rich and poor nations’. Anjali Bethune of Ruyton Girls School won the $2500 John Button Schools Prize for writing on politics and policy by a Victorian secondary student. Her essay argued that Australia should increase its immigration intake. To read more please visit the John Button Prize website.